How Much is an Infographic Really Worth? Right, so sometimes I get asked to comment on people’s blog posts or feedback on a certain area and every now and again go somewhat overboard with the response. I have just done that very thing whilst commenting on a blog post from one of my friends in the industry Chee Ho Wan in response to this post looking at answering the question “Is my infographic worth £2,000?”. After looking through some of his logic and reasoning as well as some of the tough questions asked I came up with the following response/rant. His main questions arose from the fact that on average, across a group of randomly selected infographics, he found that based upon a cost of £2,000, the average value of each link was somewhere in the £100+ range per unique linking domain. Chee also pointed out the fact that doing a series of these may be higher yield and that without setting targets for the agency these can be quite expensive endeavours. I agree with Chee to a large degree and think he raised some very good points. I strongly suggest you read his article before this one, as my response will make a great deal more sense. 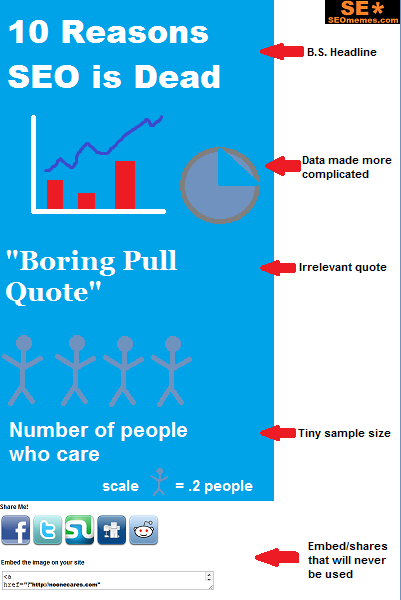 I just thought I’d add my two cents on this and comment that there are any number of reasons why infographics do or do not work out in the end in my experience. I think you’ve really covered a lot of the concerns on the topic quite well, but as you asked, I will happily provide you with my thoughts because infographics always get a strong response from me. The first question I would have for you would be: what did you use for link data and how old are the sites? Some of the crawls seem to be way behind other sites and some seem to be very generous so just curious about methodology for checking links and unique linking domains. 1. Targets, as you touch on are important as is the reason for creating the graphic. If it was done because it’s the trendy thing to do then it’s already a failure. Meaningful targets should be: we want to get more traffic or we want to acquire more links, but rarely both. 2. Cost is a big factor here, if £2,000 were the whole cost then 90 new unique linking domains that were natural would be a great investment for my money. Again, bearing in mind that these are permanent links and assuming they’re good (and indeed natural) that’s a much better return and more sustainable than you’d get from shelling out for links each month. And I do think that for the most part you get what you pay for… you don’t really want to end up with something like the below! 3. There will likely be diminishing returns from each additional graphic – unless that is the focus of the site/blog/section you are building up. 4. Even with all that said infographics can provide a great opportunity to get links from unique domains and often from domains that would not normally link to your site (design sites, smashing magazine, etc.). 5. Infographics are, in general, overplayed as a technique and often made when not particularly valuable or made in a way that does not attract a lot of interest or interaction. I vented my feelings on this in a post I wrote on the “Future of SEO”, but generally feel like they are often used when a microsite/scrolling parallax/series of individual charts/video would do the same job or better. The infographic is a great tool to have in the arsenal but is too often used as a first choice linkbuilding strategy. 6. It really is all about the outreach and the plan/prospecting before the graphic is briefed and designed. Sometimes you’ll get lucky (first page of Digg, picked up on the BBC, etc.) but ultimately if the agency or whomever is working on the outreach isn’t good at outreach and linkbuilding you won’t get a lot out of it. As you mentioned, in general, a graphic about SEO, online marketing, or other online subcultures will likely perform better than one about stamp collection. With very few exceptions (i.e. roughly one per major vertical) and without a very large budget, these graphics are unlikely to regularly generate a lot of links and certainly won’t without proper outreach… which some would argue could be achieved more inexpensively with a great blog post/top 10 list, good imagery and the budget invested in outreach. 7. Most importantly, from what I have seen (anecdotally speaking here), inforgraphics don’t tend to rank. I can think of very few examples where an infographic got a page to rank particularly well for the subject matter of the graphic. I won’t say it’s never happened but I can’t think of many examples when looking through the competitive niches. There is a time and place for infographics and they can be beneficial. They require time and effort, good targeting, and a bit of luck… but can still attract some good links. When done well I still think there’s scope for these and I do think it’s worth doing once or twice for most sites to spread out the unique linking domains. However, unless you are going to really go out and nail it and stick to this as a core part of your strategy (or have great contracts/kill it on general linkbuilding outreach) it will more often than not, reveal fairly weak results, attract links from sites that aren’t particularly relevant to most verticals, and may cost a fair bit of money. I would certainly say there’s still value to be had from these, but I really think they’ve passed their heyday and it’s better to spend your budget developing something unique for £2k than something that a lot of people have tried already. Thanks Chee, I appreciate this is probably a much longer response than you were expecting/hoping for! I generally used yahoo site explorer, and chose infographics which were at least a month old (although most were alot older). It was not overly scientific. But going through the backlinks manually I was able to spot trends on what was making infographics successful (in terms of what other agencies had done well) which was the overall purpose of the exercise. The two key things that really stood out were having topical creative and a killer follow up outreach strategy. The one thing going for infographics over link baits like “top 10’s” was that infographics are portable and easy for bloggers to use on their site. So make them great media for selling to bloggers rather than the guest blogger technique (which just does not work for some sites). Hey Chee, thanks for the response. If those were the numbers based on Y! then I definitely think that’s a pretty steep investment for the return but I still think it’s probably worth looking at on an individual basis. Totally agree with your additional points here in the comments and that’s really cool that you picked up on some trends from multiple agencies in terms of what worked well – would be curious to discuss that side of things over a pint at some point. I think infographics have their place (like all tactics), but work better in niches that haven’t been bombarded with them already. It’s definitley about the way you market them and who you approach. In most cases i personally wouldn’t produce them as a mass appeal, everyone is going to link and share tactic. I would really use them to target specific sites that you wouldn’t get coverage from any other way. We produced an infographic (inhouse as we were on a budget) for one of our clients and targeted only the top magazine sites and bloggers in their market to host it, people who generally wouldn’t link to a commercial site for free. The topic area was never going to generate hundreds of links, but thats not really what we wanted. We got a small amount of really great quality realted links, got featured in a print magazine and a press pack and built a lot of positive realtionships (a lot of sites asked for more material from us, making future link building a lot easier). It even got to the point where a couple of the bloggers who didn’t feature the graphic on their sites used their social media accounts to recommend our client to their followers. I think you have to be realistic about what you want to achieve, make sure the research is interesting and the graphic is visually interesting (so many crap ones about). I agree its all about the outreach, don’t expect it to market itself, you have to allow at least the same time for marketing as you did production!